Just who does Amy Schumer think she is anyway? With big screen success, TV shows, stand-up specials, book deals, awards accolades and celebrity friends aplenty you can begin to see right through her, or at least that's what she'd like you to think. Back for the fourth season of her hit Comedy Central sketch show, with this giant-sized 'Overexposed' ad creative the comedian continues to poke fun at herself, which makes her even more endearing. Yes, far from being sick of seeing her everywhere, people are still clamouring for more of the outrageous funny lady, be it in cinemas or on the small screen. 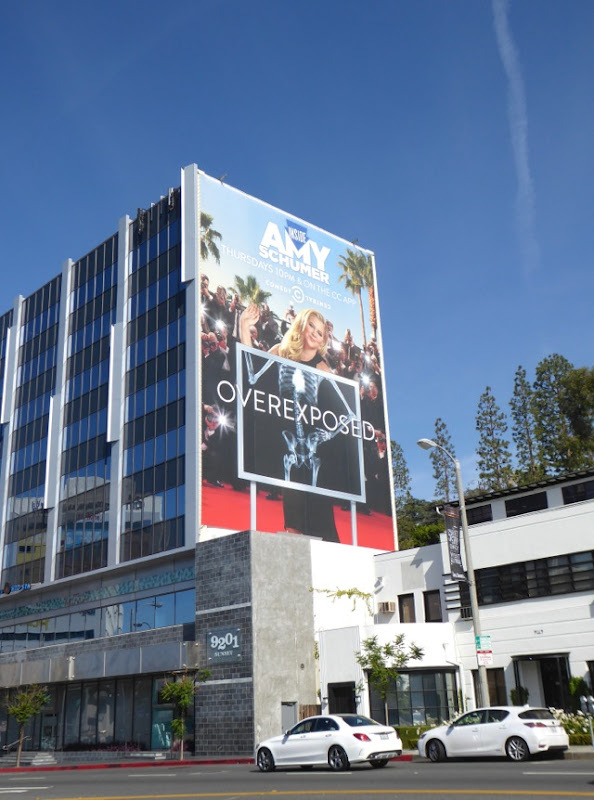 You can also tell her success has reached new heights in Hollywoodland, as Comedy Central has even shelled out for this super-sized billboard location along West Hollywood's Sunset Strip rather than their regular landscape ad spot further east along the Strip. 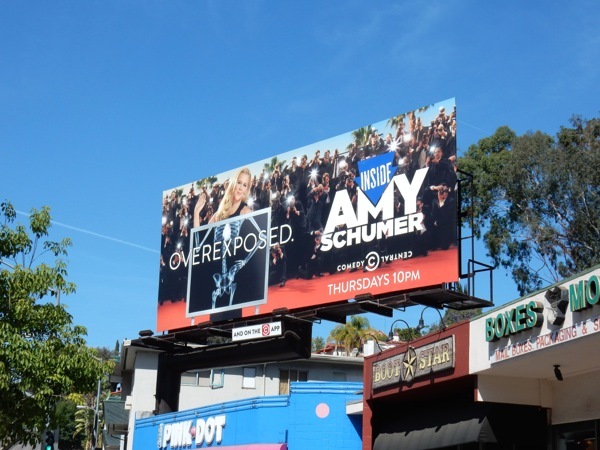 If you like this giant x-ray billboard creative for season four of her comedy series, which was first spied on April 5, 2016, then be sure to also check out these previous season promo billboards for Inside Amy Schumer from recent years. Plus at the same time you can also enjoy billboards for Amy's live stand-up HBO show at The Apollo, billboards for her debut movie Trainwreck, 2015 MTV Movie Awards and VH1 Big in 2015 Awards outdoor ads. Who does she think she is? Amy Schumer that's who. Always outspoken and hilarious, never afraid to challenge perceptions of herself or the world, and enjoying her moment in the spotlight (long may it last). 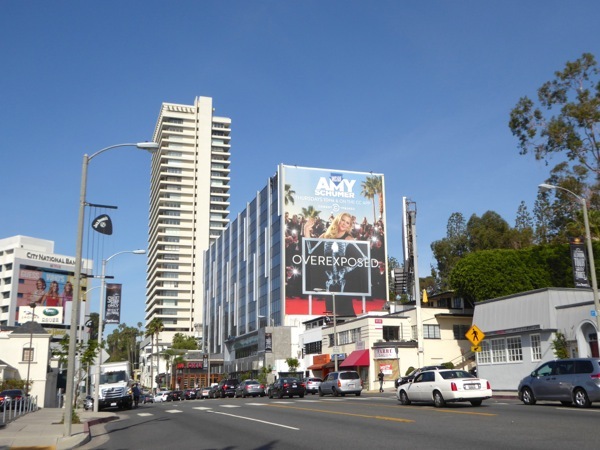 UPDATED: You can certainly tell that Amy Schumer is in the spotlight at the moment, as here's another billboard for the star's fourth season along the heavily trafficked Sunset Strip on April 12, 2016. Enjoy the attention Amy, as fame is a fickle thing, one day you're in and the next you're out. Plus here's a slightly different ad creative spied eastbound along Melrose Avenue on April 16, 2016. And here's a landscape version of the season four creative, showing off more of the bank of photographers, snapped in Comedy Central's regular Sunset Strip ad site on May 3, 2016.